Social media bloggers like Zoella are driving more traffic to their sites than traditional consumer media channels and brands need to wake up to the possibility of collaboration. According to Dominic Smales, MD of social talent agency Gleam Futures, vloggers and social media stars are driving more traffic to their channels than established media, and have heralded in a new era of consumer engagement. Speaking at the ISBA annual conference today, he highlighted the huge diversity of social media 'talent' across YouTube and urged brands to think about "credible" and authentic ways of collaborating. Social media stars were, he said, "dwarfing traditional celebrity" in many instances and were having measurable impacts on brand sales where tracked against traditional marketing spend. For example, in one instance, he claimed one tweet from blogger PixiWoo delivered a significant spike on traffic to the site of a fashion brand that was also sponsoring a prime time ITV show at the same time. "One Tuesday afternoon I was in the marketing director’s office and I opened up their website and I opened up live Google Analytics and [the tweet] delivered 124% more traffic than the sponsorship idents had on ITV," he said. He said that one misconception is that YouTube fans, who he said were highly engaged, were children with no spending power. However he said the audiences were "so vast that even if you look at 18-34 in the UK, Zoella’s channel, she’s outpacing Glamour, Vogue Grazia – all of them – by over 100%"
"There’s been a real tipping point in last 12 months," he said, "a massive moment in the evolution of this space." At one book signing with blogger Alfie, 8,000 fans turned up. The same week David Beckham did a signing where 670 fans turned up. Brands, however, needed to think up ways to work with them credibly. "These are creative individuals, they are not doing it to be brand ambassadors," he said. 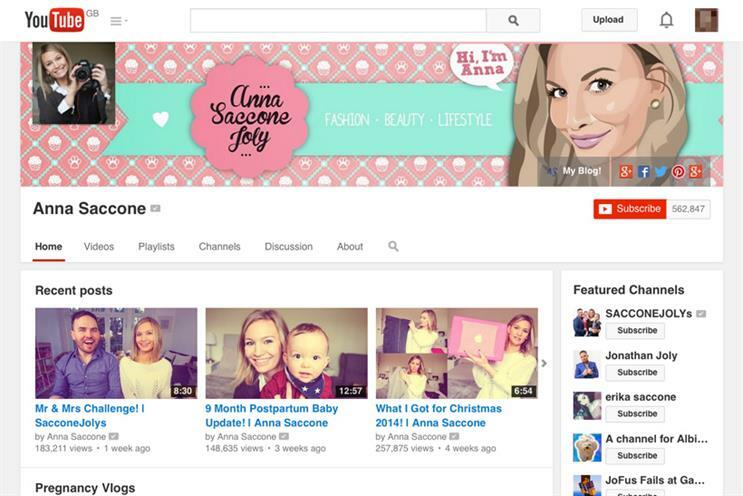 "The best example is a channel launched by Asda ‘mum’s eye view’ where turned it over to the talent to make videos. Zoella shot a video herself of making cupcakes, which did 700,000 views. When you type in baking that’s the video you find and it’s got Asda written all over it."